What Else Can I Expect From an Online Associate in General Studies Program? 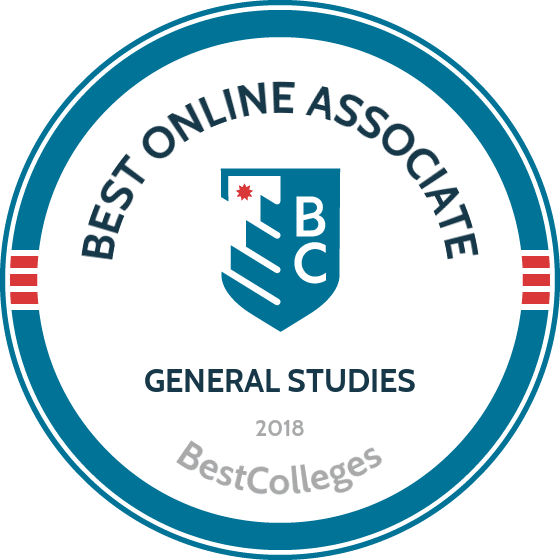 What Are The Best Online Associate in General Studies Programs? What Can I Do With an Associate in General Studies Degree? General studies associate degrees are designed for students who plan on pursuing an advanced degree but do not know what field they want to study. These programs consist of general education courses that provide the foundational and critical thinking skills for advancement to upper-level college courses. So if you need some time to explore your options, a general studies associate degree may be right for you. According to the National Association of Colleges and Employers Salary survey, the average starting salary for graduates with a general studies degree was reported at $45,000, an increase from the previous year's mean salary of $41,605. $7,100 to $10,000 is the average cost for a year's tuitio. Based in Rexburg, BYU-Idaho offers a well-rounded associate in arts in general studies for those planning to enter the workforce or pursue a bachelor's degree. Requiring 60 credits to graduate, including 26 credits of elective coursework, the online general studies degree strengthens your critical thinking skills through a foundational course sequence in the natural sciences, humanities, arts, and mathematics. BYU’s Mormon tradition is also reflected in several religious classes that are included in its core curriculum. Because students can take classes part- or full-time, tuition rates and program length vary and depend on several factors, including accelerated formats and transfer credits. Those who enroll in 11 or fewer credits per semester pay per credit, while those taking 12 credits or more pay per semester. Applicants must complete at least 15 college credits on campus or at a partner institution with a GPA of 2.5 or better. Odessa’s online general studies associate degree prepares students for further study at the baccalaureate level. The associate in arts in general studies consists of core classes in English, the humanities, mathematics, and the natural sciences, and also requires 18 semester credit hours in life enrichment electives. The degree can be completed in two years, but the school allows distance learners to study part-time. Students who plan to pursue a bachelor’s degree are advised to coordinate with prospective universities as they plan their schedule at Odessa. The school encourages both first-time and transfer students to apply. Transfer students must complete at least 25% of the degree at the college, which amounts to 18 to 30 semester credit hours. Applicants must provide high school or college transcripts, or proof of GED, and must graduate with at least a 2.0 GPA. Tuition rates vary based on in-district, out-of-district, and out-of-state residency. Northern State’s associate in arts in general studies consists of 60 credits, including core requirements and electives. Students must take two composition courses and one public speaking class, as well as 12 to 14 credits in the humanities and fine arts. Additional core requirements of the associate of general studies degree include classes in mathematics, the natural sciences, and personal wellness. Although students must take one or several courses in each core subject area, elective credits may be pulled from any university department. Prospective students should submit high school transcripts or GED scores. Applicants must rank in the top 60% of their class, have a cumulative GPA of at least 2.6, or submit an ACT composite score of 18 or an SAT-I score of 870. South Dakota and Iowa residents pay the lowest tuition, while Minnesota residents also receive a discount. An associate in general studies degree can be completed entirely online at MSU-Billings. This 60-credit program prepares students for further education and professional careers in a variety of fields. The general studies degree online also allows students to sample several disciplines including psychology, philosophy, history, and the humanities, all of which teach students how to analyze complex information and ideas. Students take 31 credits of core courses, 21 credits of general studies courses, and eight elective credits. First-time and transfer students may apply. All applicants should submit proof of high school graduation or GED in the form on transcripts along with ACT or SAT scores. Transfer students should submit transcripts from all prior institutions. Montana residents receive a tuition discount. Keiser’s associate of arts degree in general studies is designed for students who want to dip their toes in a variety of topics and disciplines. The 60-credit program is offered entirely online. Students take 36 credits of core classes and 24 credits within a general studies major consisting of subjects such as business administration, health services administration, homeland security, legal studies, management information systems, and psychology. Core requirements of the general studies associate degree include classes in communications, economics, mathematics, and the natural sciences. All courses must be completed with a “C” or higher in order to graduate. Applicants should submit high school transcripts or GED scores, as well as ACT or SAT test scores. Students pay the same per-credit or per-semester rate (depending on the number of credits taken per semester) regardless of residency. Located in Warren, Michigan, Macomb’s general studies degree online is for students who want the flexibility to design their own course of study. Although the program has several general education requirements in the social sciences, communications, English, mathematics, and natural sciences, students working toward the 62-credit associate of general studies consult closely with advisors to create a study sequence that best suits their goals and interests. To graduate, students must maintain a cumulative GPA of at least 2.0. The college also offers a generous transfer credit policy. Students must earn at least 15 credits at Macomb in order to receive the general studies associate degree. Applying to MCC is easy, as there is no fee or entrance essay requirement. Transfer applicants should submit transcripts from prior institutions with a minimum cumulative GPA of 2.0. First-time students must provide proof of high school graduation or a GED. Indiana Wesleyan offers a fast track to earning a general studies associate degree. Its 62-credit associate in science in general studies program may be completed entirely online or in a hybrid online and on-campus format in just 18 months. With only 23 credits of core classes, students have the flexibility to design their own course of study in business, computer information technology, human services, marketing, and religious studies. The program’s unique format also allows students to concentrate in more than one area. The university has a generous transfer policy, as students must complete only 30 credits at Indiana Wesleyan. A cumulative GPA of 2.0 is required for graduation. To apply, students should submit proof of a high school diploma or GED. Tuition is the same per-credit rate regardless of residency. Qualified applicants are also eligible for financial aid. Located in Natchitoches, NSU offers a comprehensive general studies degree online that immerses students in a number of interrelated disciplines. The associate of general studies curriculum consists of 60 credits, 28 of which are core courses. Students also take 36 credits across three concentration groups, including a main group of 18 credits and two academic enrichment groups that are nine credits each. Prospective students must have earned a high school diploma after completing the Regents’ Core with a cumulative GPA of 2.35 (or 2.0 with a score of 940 on the SAT). ACT, SAT, or COMPASS writing scores are also required. Out-of-state online students pay the same tuition rate as Louisiana residents, but tuition rates vary depending on the number of credits taken each semester. Located in Bel Air, Maryland, HCC offers a unique online associate degree in general studies that fuses the structure of a traditional degree with the flexibility of a typical general studies program. The associate of arts in general studies curriculum consists of 60 credits, including 34 credits of general education courses and a 12-credit concentration. Nineteen free electives also give students room to explore their diverse academic and personal interests. Designed as a full-time program, students take 15 credits per semester and graduate in two years. Applicants should submit high school or GED transcripts. Tuition rates are tiered based on residency. Hartford County residents pay the lowest per-credit rate, while Maryland residents outside of Hartford County also receive a discount. Out-of-state students pay a higher rate. Financial aid is available to qualified applicants. From its campus in Toms River, New Jersey, OCC offers an online general studies degree tailored to the needs of individual students. The associate in science in general studies consists of 60 credits, 30 of which are core requirements. The general studies component is satisfied with 18 credits chosen from several college departments (business, science, computers, the humanities, or the social sciences). The remaining 12 credits are electives. OCC’s application is free and simple. Students should fill out the online or paper application and submit proof of high school graduation or a GED. They should also file the FAFSA to become eligible for financial aid. From there, applicants take placement examinations to determine their standing in English and mathematics. Ocean County residents receive a tuition discount; all other students pay a nominally higher tuition. DSU has delivered a quality education at its campus in Madison, South Dakota since 1881. The school's online general studies associate degree is taught in the same tradition of excellence. The associate of arts in general studies curriculum is made up of 60 credits, 30 of which consist of general education requirements with the other 30 consisting of classes students select from multiple disciplines. The program can be completed in two years of full-time study (four semesters), with opportunities for electives starting in the second semester. Prospective students must submit their application and all related materials prior to the Wednesday before the next semester begins. The summer semester is split into two six-week sessions, giving applicants more than one opportunity for summer admission. In-state and out-of-state students pay the same per-credit tuition rate. Liberty’s online general studies degree is designed to prepare students for the workplace by giving them a strong foundation in communication, writing, and analytical reasoning. The associate of arts in general studies trains graduates for positions in administration, banking, customer service, and project management. Courses are also delivered asynchronously for maximum flexibility. The program consists of 60 credits (39 general education requirements and 21 electives), 45 of which may be transferred from another institution. Liberty is a Christian university that believes in service through faith. Applicants must submit high school or GED transcripts as well as ACT or SAT scores. Liberty requires a minimum cumulative GPA of 2.0. Online tuition rates are the same regardless of residency, though full-time per-credit tuition is priced lower than part-time per-credit tuition. The university is located in Lynchburg, Virginia. Though located in La Plata, Maryland, CSM’s general studies degree online ensures that students can earn their degree from anywhere. The associate of arts in general studies is a 60-credit program that can be taken part- or full-time. The full-time option takes four semesters over the course of two academic years. Students must complete general education requirements and select a concentration. Concentrations include communication, criminal justice, forensics, English, and media studies. Students must also take a career exploration course within the first 24 credits of the program. CSM offers a generous transfer credit policy. Up to 45 credits may be transferred into the general studies program. Transfer students should provide transcripts from all prior institutions. First-time applicants should submit high school or GED transcripts along with ACT or SAT scores. Located in Annandale, Virginia, NVCC offers an associate degree in general studies that provides ample flexibility for students wanting to choose their own course of study. Designed to transition students into bachelor's degree programs, the associate of science in general studies is a 60-credit, two-year program encompassing 36 electives and 24 general education courses. Although students spend most of the first year completing core requirements, they spend the entire second year immersed in electives. One of the school's core classes teaches college success skills to ensure high achievement at both the associate and baccalaureate levels. The college welcomes new students with an “open door” admission policy. Applicants who have completed high school or a GED are welcome to enroll. New online students are asked to take English and mathematics placement exams. Virginia residents and military personnel receive a tuition discount. The associate of general studies at MSU consists of 60 credit hours. Like other online general studies degree programs, MSU requires the completion of core requirements consisting of 37 credits as well as several electives. Students are also free to pursue one of three concentrations including applied and natural sciences, arts and humanities, or behavioral sciences. An academic advisor is assigned to each student at the beginning of the program. Students must earn a GPA of 2.5 for the first 12 credits in order to progress to concentration course selection. Applicants who are Louisiana high school graduates must have earned a GPA of 2.35 and must submit a minimum ACT score of 30 or SAT score of 1020. Out-of-state applicants should have completed 17 out of 19 Regents' Core courses. In addition to college transcripts, transfer applicants with fewer than 18 college credits should submit high school transcripts and exam scores. Louisiana residents pay discounted tuition. SDSU's associate of arts in general studies is a 60-credit program requiring students to take a mixture of general education requirements and electives. The core classes are spread across several academic areas: humanities, mathematics, natural sciences, oral and written communication, and social sciences. Although the campus is located in Brookings, South Dakota, the program’s distance component makes it accessible across the country. However, state policies require Minnesota residents to take a slightly different degree path by taking 40 credits of general core courses. Applicants should submit all high school and college transcripts along with ACT scores. Admissions decisions are made on a rolling basis. Applicants can expect to receive a letter in the mail within three weeks of submitting their materials. In-state tuition is moderately discounted. The associate of general studies at Columbia College is unique among general studies degrees for offering students tremendous flexibility in their course selection. The program consists of 60 credits, 36 of which are made up of electives. Students work closely with their academic advisor to choose elective classes in the liberal arts, natural sciences, or any pre-professional program. In addition to instructing students in traditional academic disciplines, such as English composition, the general education requirements impart vital 21st-century knowledge in subjects like computer science and computer information systems. Applicants should submit all high school and college transcripts. Prospective students who have completed Advanced Placement courses should also arrange for those scores to be sent to the admissions office. Even though the main campus is located in Columbia, Missouri, tuition is the same per-credit rate regardless of state residency. Some nontraditional students receive a discount. Located in Russellville, ATU offers an associate of general studies degree that is designed as a part-time program. The 62-credit associate of arts in general studies imparts professional skills for careers that do not require a traditional four-year degree. The degree also lays the groundwork for future baccalaureate study. Servicing these goals is a curriculum requiring 37 credits of core classes and 35 credits of electives that are selected with the help of an academic advisor. This nearly even split of core and elective courses allows students to explore many academic and professional interests. Both first-time and transfer students may apply, though the program’s part-time nature is geared slightly toward transfer students. Transfer students with fewer than 24 college credits and first-time applicants must submit high school transcripts and ACT or SAT scores. Transfer applicants must have a cumulative GPA of at least 2.0. In-state students receive a tuition discount. Located in Fairfield, Illinois, FCC’s associate in general studies provides students considerable leeway to design their own course of study. The 64-credit curriculum consists of only 20 credits of core requirements, allowing students to enjoy 44 credits of concentration studies and electives. There are seven concentration areas to choose from including communication, general business, humanities, mathematics, and technology. Each concentration area is further divided into subspecialties catered to each student's unique interests. Most concentrations are 12 credits long, though some may require more. Applicants should submit high school transcripts or GED scores. ACT or SAT scores are also required. Transfer applicants must submit college transcripts from a regionally accredited institution. Applications are due 30 days before the start of the desired term, but the college does accept late applications. In-state students receive a tuition discount. Pierce's flexible online general studies associate degree produces well-rounded graduates who are ready to take on the workplace or transition into a bachelor's-level program. The 61-credit associate of arts in general studies sharpens students' written and oral communication skills in disciplines such as business, legal studies, and technology. The general education core consists of only 28 credits, giving students ample room to select electives. Classes may be taken entirely online or as part of a hybrid program in which some instruction is given at the college’s Philadelphia, Pennsylvania campus. First-time applicants should submit high school transcripts or GED scores. Transfer applicants who have not taken the requisite college-level English or mathematics courses are required to take Peirce placement examinations. However, placement examinations may be substituted with ACT or SAT scores. NCC offers its online general studies degree as a degree completion program for students who have already earned college credits without selecting a traditional major. The associate of arts in general studies is a 60-credit program broken into 31 credits of core requirements and 29 credits of general studies courses. As part of the general studies component, students pick classes from a variety of academic departments. Working with their advisor, they also have the option of taking vocational training courses that assist with post-graduation employment. The college is located in Norfolk, Nebraska, and students who are residents of Nebraska, Iowa, or South Dakota pay a discounted tuition. First-time and transfer applicants should submit high school and, if applicable, college transcripts. The college also requires ACT or SAT scores, but applicants may substitute these scores for ASSET/COMPASS testing by contacting the college’s Test Center. The associate of arts in general studies at Granite State may be completed almost entirely online, but some courses require in-person instruction at the college’s Concord, New Hampshire campus. Students learn from faculty with real-world experience, helping to prepare them for professional placement or future academic pursuits at the bachelor’s level. Academic advisors provide guidance during the 60-credit course of study, which includes classes in American culture, critical inquiry, persuasive communication, science, and writing. The general studies concentration consists of 20 credits. This online general studies degree is especially well-suited to transfer students, as 84% of enrolled students transfer credits from another institution. To be granted transfer admission, students should submit all prior college transcripts. First-time applicants should submit high school transcripts or GED scores. The application is free. Out-of-state students pay a nominally higher tuition than their in-state counterparts. Located in Ogden, Utah, WSU’s associate degree in general studies helps students achieve entry-level professional positions or prepare for future baccalaureate studies. This 60-credit program is designed to be completed in two years and is meant to enhance student achievement in a variety of academic areas including the humanities, fine arts, physical and life sciences, and social sciences. Students planning to pursue a bachelor's degree after receiving their associate degree are encouraged to consult with an academic advisor. Admissions decisions are made on a rolling basis. Prospective students who have earned fewer than 30 college credits should submit all high school and college transcripts or GED scores. ACT or SAT scores are also required. WSU charges lower tuition for resident students, and students who enroll in 11 to 18 credits per semester pay a flat-rate tuition. USD’s online general studies degree is perfect for those planning to transition into a bachelor’s degree program in South Dakota. This is because the curriculum for the associate of arts in general studies meets the general education requirements of all four-year public colleges throughout the state. The program consists of 60 credits that can be completed in two years of full-time study. Although students are required to take courses in subjects such as composition and fine arts, each area offers a number of class options to help students design a study program that suits their interests. Applicants must have earned a GPA of at least 2.6 in all high school classes and must submit high school transcripts or GED scores. They should also submit ACT scores of 21 or higher and SAT scores of at least 990. South Dakota and Iowa residents receive a tuition discount. Located in Neosho, Missouri, Crowder’s online associate of arts in general studies balances its core requirements with the student’s choice of general studies electives. This structure is designed to foster students’ exploration of possible career paths. The online associate degree in general studies can be completed in two years, and is unique in that it allows students to take electives in their first semester. Students are paired with a faculty advisor who helps them select classes and plan for the future, whether that means getting a job after graduation or transitioning into a baccalaureate program. Prospective students must submit all high school or college transcripts along with their application. They should also submit ACT or COMPASS scores. High school students with Advanced Placement credits will receive college credit for scores of “3” or higher. In-state residents receive a tuition discount. The basic skills learned through a general studies degree online, such as critical thinking, scientific knowledge, and written communication, can be applied in a variety of other careers, including business, social work, and politics. Many of these skills and course credits are transferable to higher degrees. An associate in general studies degree will provide you with many opportunities. Below is a list of potential occupations for general studies graduates. Psychiatric technicians help individuals with mental illnesses and developmental disabilities. They provide care and assist on-call psychiatrists. This career requires at least a high school diploma. Medical laboratory technologists and technicians help researchers and doctors collect patient samples and perform tests. They often work in hospitals, medical research laboratories, or doctor's offices. The technologist career typically requires a bachelor's degree; technicians need an associate or postsecondary certificate. Some states require additional licensing. Veterinary assistants and laboratory animal caretakers assist veterinarians and animal researchers in their day-to-day activities. Their responsibilities include caring for animal patients, performing routine exams, and other tasks in the lab or veterinary office. Most veterinary assistants have a high school diploma. Social and human service assistants help clients identify their needs and solve problems. They can be found working for nonprofit organizations, social service agencies, and government agencies. This position requires at least a high school diploma. Teachers Assistants perform daily tasks under the guidance of a university professor or postsecondary educator, including grading papers, guest lecturing, holding office hours, and providing additional study sessions. They work in public and private colleges, high schools, and sometimes even childcare centers. Teacher assistants usually need to complete at least two years of college coursework. After obtaining an associate degree in general studies, you may want to consider transferring into a bachelor's program. A bachelor's degree can provide you with even more career opportunities, however, you will need to decide an area of interest. Many professions require potential employees to hold at least an undergraduate degree. Earning an advanced degree can also lead to higher earning potential. Psychology: A bachelor's degree in psychology allows students to pursue careers as psychologists, therapists, school counselors, and more. Social Work: Social work programs combine social science research and methodology in order to develop programs that help solve social problems. Many social work programs include coursework in other departments, like sociology, psychology, economics, and law. A bachelor's degree in social work allows students to pursue careers in social services, government agencies, and nonprofit organizations. Biology: Topics covered in biology programs include plant and animal evolution, cell structure, and genes and heredity. A bachelor's degree in biology prepares students for careers in the natural sciences or in medicine. Education: Students in education investigate how learning and knowledge acquisition occurs in order to develop appropriate teaching methodology or pedagogy. A bachelor's degree in education prepares students to be teachers in a variety of different subjects. Individual workplaces and industries can impact the annual earnings of general studies graduates. The following table features data from the Bureau of Labor Statistics showing the median annual salaries for medical and laboratory technicians in various industries, including colleges, hospitals, physician's offices, and medical laboratories. Professional general studies organizations are dedicated to promoting engagement in general studies or other interdisciplinary programs. These organizations offer the opportunity to meet other working professionals, participate in general studies conferences, and learn about job openings in the field. Conferences hosted by professional organizations provide an opportunity to present research. Professional organizations related to your field can help you reach your career goals. The Association for General and Liberal Studies is dedicated to fostering general education and liberal studies programs at colleges and universities. They host conferences, award programs, and publications in an effort to facilitate innovation in general studies curriculums and pedagogy. The AIS is a professional organization that promotes the development of interdisciplinary and integrated studies. It was founded in 1979 as a nonprofit educational association in Ohio. AIS hosts an annual conference for scholars doing interdisciplinary research. The NHA is an advocacy coalition for advancing humanities education and research in the United States. They lobby for funding and financial support for the humanities research and education, push for policies that foster improvements in humanities programs, and generate political and public interest in humanities-related disciplines. There are many financial aid opportunities for students pursuing a general studies degree online. Some schools offer financial aid programs or scholarships to students, including general studies merit-based or need-based fellowships. All students should fill out the Free Application for Federal Student Aid. This allows you to see how much federal aid you're eligible to receive, and the application is free to complete.